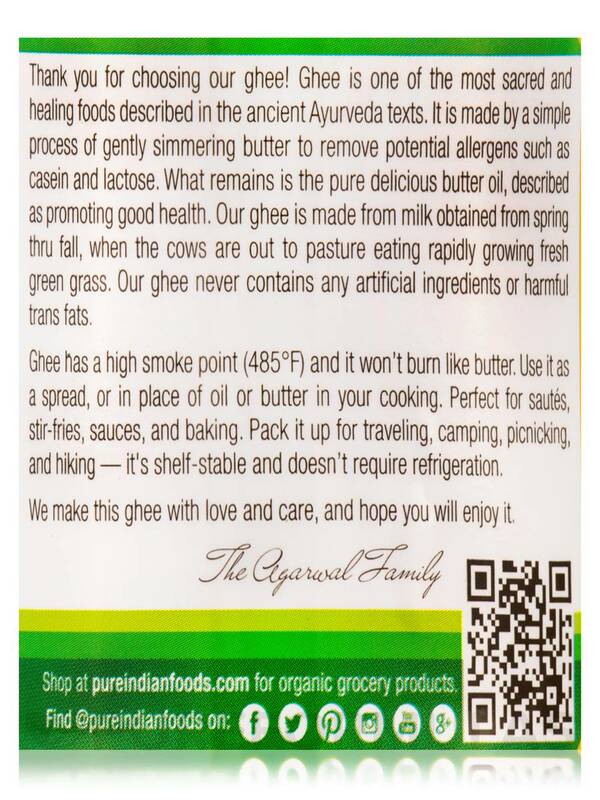 Food tastes good when cooked with Ghee by Pure Indian Foods. A fifth-generation‚ family-owned ghee business... Since 1889! 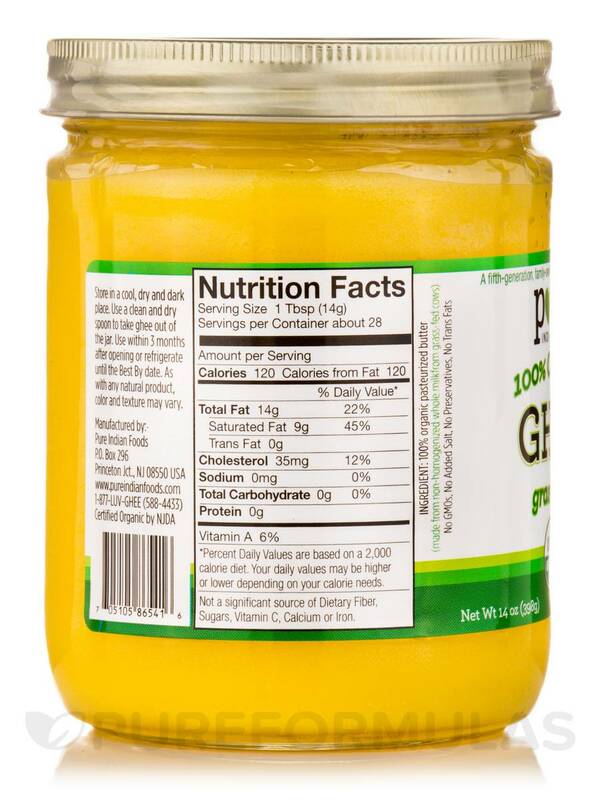 Grass fed organic ghee offers all the wonderful flavors of butter‚ but with the shelf life of cooking oils. 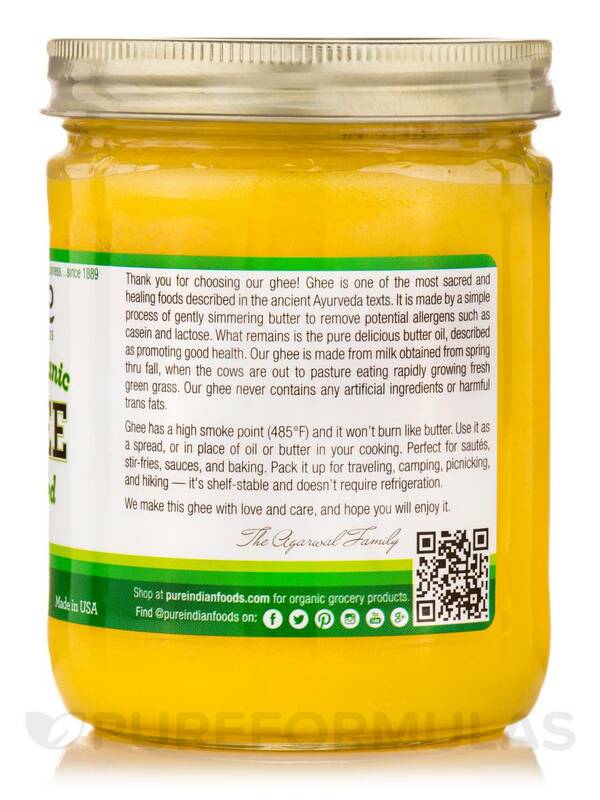 Ghee is gluten-free and provides healthy fats‚ a variety of practical cooking applications‚ and the buttery taste you love on your favorite foods. 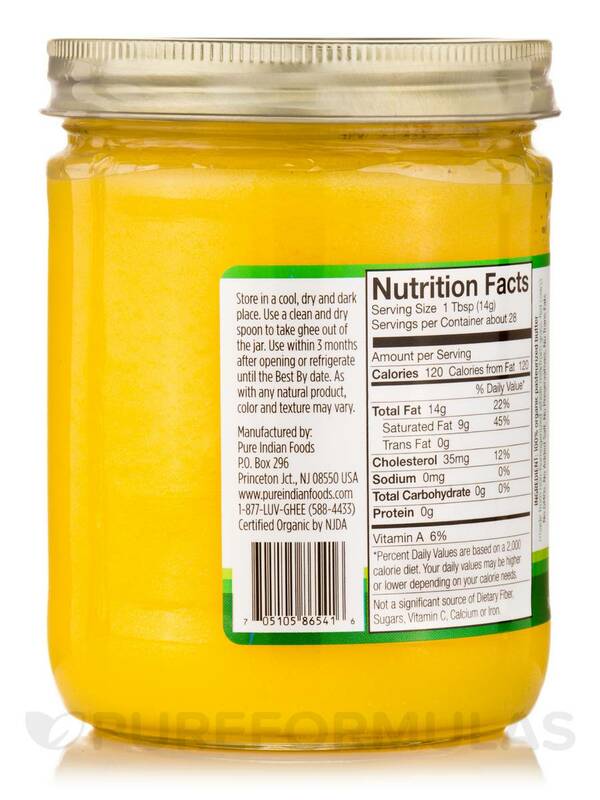 Ghee is highly potent so a little bit goes a long way‚ making it last longer than an equivalent quantity of butter. 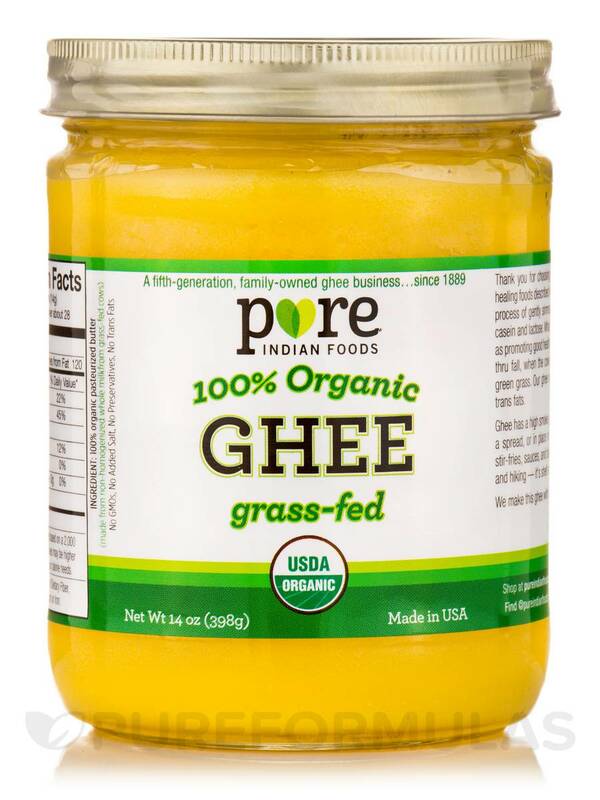 Bake‚ fry‚ saute‚ and change your diet for the better today with organic Indian ghee from Pure Indian Foods! *Percent Daily Values are based on a 2‚000 calorie diet. Your daily values may be higher or lower depending on your calorie needs. Not a significant source of dietary fiber‚ sugars‚ Vitamin C‚ calcium or iron. 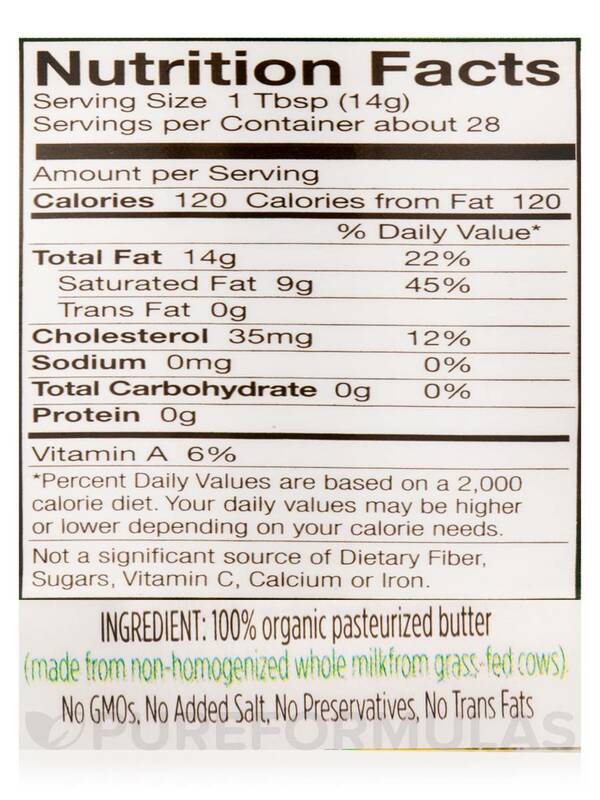 Ingredient: 100% Organic pasteurized butter. (Made from non-homogenized whole milk from grass fed cows). No GMO's / No Added Salt / No Preservatives / No Trans-Fats / USDA Organic. It has a high smoke point (485° F) and it won't burn like butter. Use it as a spread‚ or in place of oil or butter in your cooking. Perfect for sautes‚ stir-fries‚ sauces‚ and baking. Pack it up for traveling‚ camping‚ picnicking‚ and hiking - it's shelf-stable and doesn't require refrigeration. 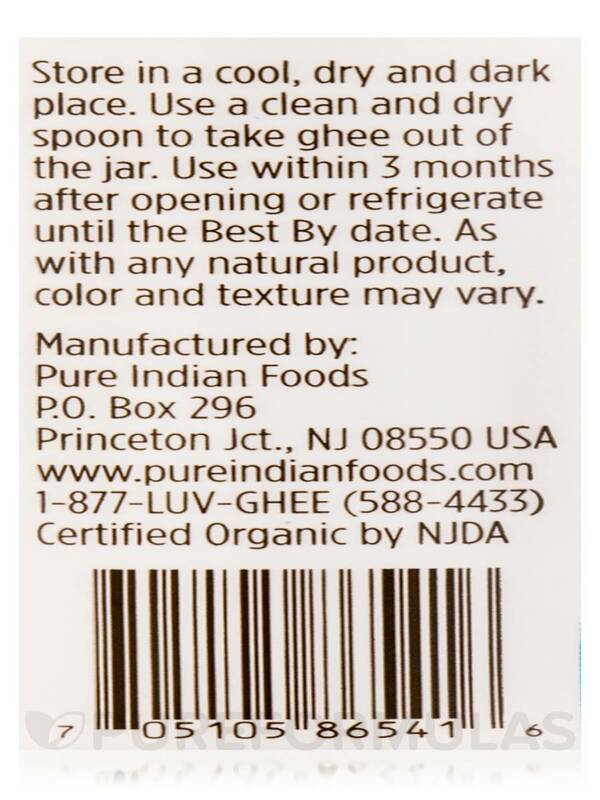 Use a clean and dry spoon to take ghee out of the jar. Use within 3 months after opening or refrigerate until the best by date. Notice: As with any natural product‚ color and texture may vary. Since we started using Ghee, we've used it for just about everything. We still use regular real butter on occasions, but this organic Ghee by Pure Indian Foods has been one of the best we've tried. We especially like the quality as well as the taste. I love it on gluten free toast, waffles, in recipes, making eggs, or just about anything. It's delicious! The great taste and that it is better for you.